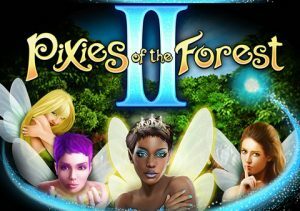 Take a second trip to a magical woodland in Pixies of the Forest II, a 5 reel, 99 payline video slot from IGT. This sequel has similar design to the original but expect plenty of added features in the form of wild extras, free spins and multipliers. Play on your PC, tablet or mobile from 33p to £99 per spin. The visuals in Pixies of the Forest II have the same magical quality as the first outing. As well as lower value A to J symbols, you’ll see 3 higher value pixie symbols spinning around the reels. The most lucrative symbol is the Pixies of the Forest logo which will get you an award of 30.30 times your bet if you land 5 in combination. Helping to create those winning combinations is the wild which can hit on the middle 3 reels only during the base game. The action here takes playing using a Tumbling Reels feature. After a successful spin, the winning symbols are removed and new ones drop in and replace them. These tumbles keep on coming as long as a new winning combination is created. Each successive tumble win increases the Spirit Meter by 1. If you manage to get on a roll and hit 3, 4 or 5 in succession, you’ll trigger the first feature we’ll look at. Feature Wilds feature – these reward you with some wild extras. You could see a stacked wild on the middle 3 reels, a selection of wilds spread across reels 2, 3 and 4 or countdown wilds which remain in position for a specified number of spins. Pixies Queen Free Spin Bonus feature – you can trigger these via the Feature Wilds feature or by landing 3 Bonus symbols on the same spin. Pick 1 of the Bonuses to reveal how many free spins you’ve been awarded. The Tumbling Reels are in play here so you could fill the Spirit Meter and get the wild extras. The standard wild can hit on reel 1 as well as reels 2, 3 and 4 during this round. The feature also benefits from the Pixie Queen’s Multiplier feature – pixie symbols that land on reel 1 can come with a 2x multiplier attached too. If she’s in a benevolent mood, you can randomly trigger the Pixie Queen’s Gifts feature as the Pixie Queen can award even more gifts. She can remove symbols from play to make it a little easier to land a winner, boost the Spirit Meter or add extra free spins (up to 180 available in total). Pixie Progressive Picker feature – land 3 Jackpot symbols on the same spin and you could win a special jackpot prize. Pick from the Pixie symbols until you find 4 that match. You’ll then win the bronze, silver or gold jackpot. There’s plenty of variety on offer in Pixies of the Forest II. The Tumbling Reels game engine keeps things moving along nicely in the base game and the wild extras and multipliers can have an impact in the features. Magical fairies wouldn’t be at the top of our list of favourite video slot themes. Pixies of the Forest II is a playable game though. If you enjoyed the original, then you should find plenty to like in this sequel. If you like sequels, NetEnt’s Blood Suckers II is recommended as to is Yggdrasil Gaming’s Vikings Go Berzerk.